1. New York rockers the Toilet Boys are playing a free show on Monday, June 14, 10 p.m., at (le) Poisson Rouge (158 Bleecker St.) with DJ Michael Formika Jones. RSVP here. 3. Is your social network a little thin? Usocial.net can help: $87 gets you 1,000 Twitter followers, $197 for 1,000 Facebook friends and $97 for 5,000 YouTube views. WARNING: This is not an endorsement of this service. 4. Clic Gallery (424 Broome Street) hosts a reception for "The Notorious Photographs of Ron Galella" tonight, June 10, 6 to 8 p.m. 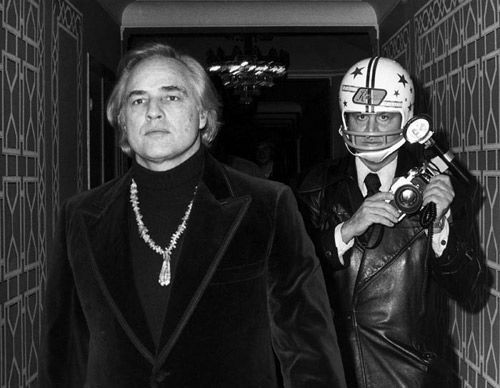 The photos (one of which, of Marlon Brando, is pictured above) are on view until the end of June. Galella has been shooting celebs since the '60s and he'll be there tonight to autograph his books. 5. Alex English is DJing tonight, June 10 (and every Thursday) in the bar at the Hudson Hotel (356 West 58th Street), 9 p.m., no cover. 6. Susan Boyle is expected to sing for the Pope in Glasgow on September 16. (via AP) The Toilet Boys are opening...just kidding.